The media responded enthusiastically to news of our $1.625 million seed round closing. Below is a listing of some of highlights. It was an exciting week for the team, which was already pressing forward on creation of the Strix Leviathan Platform. Cryptocurrency market infrastructure is woefully immature. This means that trading these currencies is a real challenge for “power users” like institutions and enterprises. There’s a wide range of exchanges, each with nuanced differences in their trading interfaces. Each has unique (and often poor quality) APIs, as there can be thousands of trading pairs to manage and document. That’s the problem Strix Leviathan aims to solve, and the seed round means we’re off to the races in making that solution a reality. There’s more coming in the months ahead, so stay tuned! Follow us on Twitter (@StrixLeviathan) to keep current on what we’re cooking up! Today, we’re announcing the seed funding of Strix Leviathan. 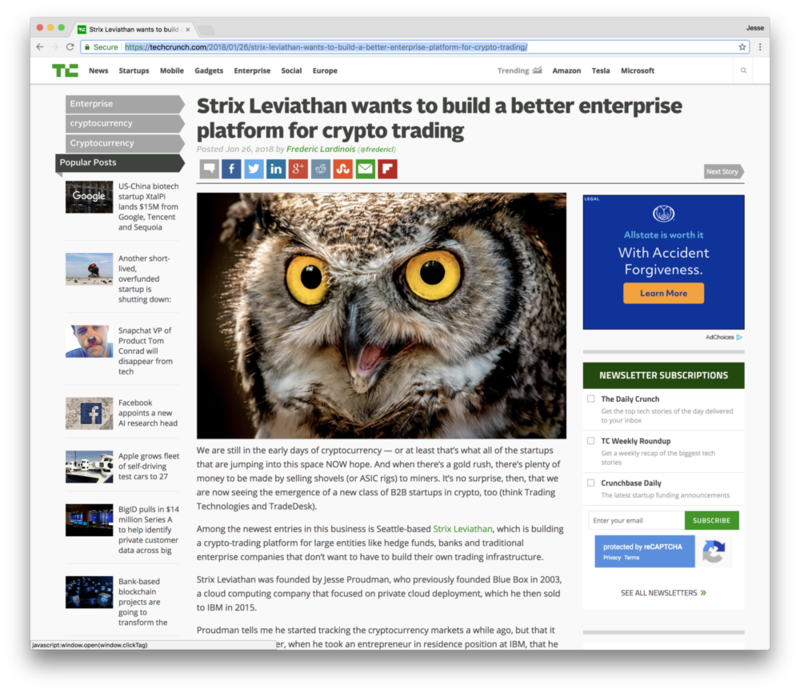 It’s an exciting, gratifying day for all of us on the team, and we’re already full-steam ahead on the design and development of the Strix Leviathan Platform. We’ve closed a $1.625 million seed round of financing led by Liquid 2 Ventures and supported by Founders’ Co-op, Future\Perfect Ventures, 9Mile Labs and Curious Capital. The round also includes an outstanding group of angels including Doug Baldwin Jr., Chris McCoy, Jeffrey Roh, Greg Strelzoff, Orion Henry, Michael Merhej, Kirby Winfield Brian Schultz, Shalendra Chhabra, David Grampa and Steve Hall. I couldn't ask for a better set of companions to set off on this journey with. Last summer my interest in blockchain and cryptocurrency crossed the line from mere curiosity to intellectual obsession when I realized that we were entering the post-gold-rush phase in the evolution and maturity of the space. With more than 1,500 cryptocurrencies issued and a daily trading volume that’s surpassed $20 billion, crypto assets have been the top performing asset class 5 of the last 6 years, according to Nic Cary of Blockchain.com. I believe these technologies and platforms are here to stay. This new phase means that providers of infrastructure and tools—those building the “picks and shovels” the industry needs—will have an opportunity to blossom and prosper. As I looked at the institutional and enterprise side of the market (companies and organizations that need to trade cryptocurrencies as part of their daily business activity) I could see that it was an underserved segment. Most of the coverage of this space focuses on the consumer investors in cryptocurrencies, many of whom are inexperienced and vulnerable to unsavory business practices. The market we’re serving—financial institutions, enterprises, and others who want to transact in cryptocurrencies—is at the very front end of what, from our vantage point, appears to be an exponential growth curve. These institutional holders of cryptocurrencies are ill-equipped to deal with the fluctuations in prices and liquidity. They need tools and a platform, and that’s what we’re building. Back to my story … as I was saying, about eight months ago I found myself captivated by the opportunity to build the tools enterprises need to interact more efficiently with existing exchanges. It reminds me of Blue Box, where we found value less in the cloud computing technology we’d developed, and more in the deployment and management of the technology enterprises needed to successfully utilize the cloud. We’ve assembled an absolute A-Team to take this hill. Ryan Tomayko leads our engineering efforts. Ryan was the CTO at GitHub and a Principal Engineer at Heroku. Lee Huffman leads our technical infrastructure and worked with Ryan at GitHub, focused on their data center deployment. Sadie Raney runs our operations, including legal, compliance, and accounting. Sadie worked with me as our Controller at Blue Box and as a program manager at IBM. Liz Fong is focused on legal and corporate operations and we had the privilege of working together at Blue Box and IBM. Steve Alkire is focused on data science programs and is a Columbia PhD in Particle Physics. He spent a number of years at CERN focused on data science for the Atlas experiment. Nico Cordeiro runs our analyst operation and was previously at PitchBook conducting private equity, VC, and crypto asset research for institutional clients. I couldn’t imagine a better team to start this company with. We’re off to a great start. Follow us on Twitter (@StrixLeviathan) to keep pace with all the excitement! Listen to Jesse Proudman explain the basics of cryptocurrency, its challenges, and how to get started with Gregg Hersholt on Seattle's KOMO News Radio on January 24th, 2018. On January 10th, Jesse Proudman appeared on King 5's New Day Northwest to provide a rundown on the basics of Cryptocurrency. You can watch the segment here.